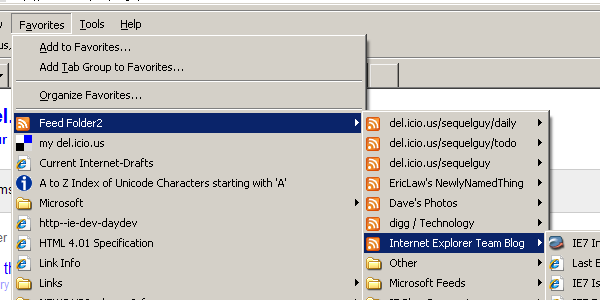 Feed Folder is a shell extension that adds a Shell Folder representing the IE7 Feed API hierarchy to your IE Favorites. This allows easy access to your feeds as folders. This is similar to the pre-IE7 Channel feature or FireFox's Live bookmarking feature. To install, simply download and run the installer. When upgrading, be sure to first uninstall any previous version of Feed Folder. Note, while Feed Folder should install and run on Windows Vista, you may experience performance problems in this configuration. Feed Folder is an unsupported tool. 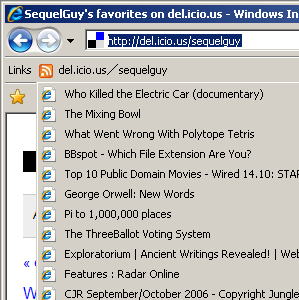 The Feed Folder is initially accessible from IE's Favorites menu and Favorites Center, as well as Windows Explorer. You can subsequently drag and drop or copy and paste a feed or sub-folder from the Feed Folder into the IE Links bar or the file system. To uninstall, open the Add or Remove Programs control panel, select Feed Folder, and click Uninstall. 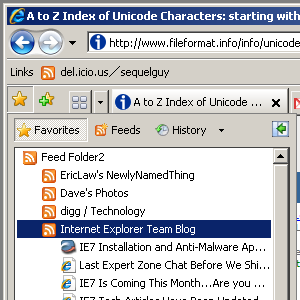 Feed Folder is an unsupported tool authored by Dave Risney on the IE Team at Microsoft. Please send any comments or questions to . ©2007 Microsoft Corporation. All rights reserved.